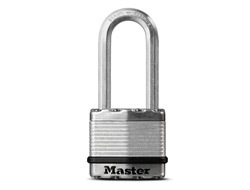 This lock is part of Masterlock's Excell Series but in the long shackle variation. You see many engineering applications that use the octagon to increase stengeth. This is simply due to the geometry of the eight sides and this is why you will often see crow bars built from octaganol steel. 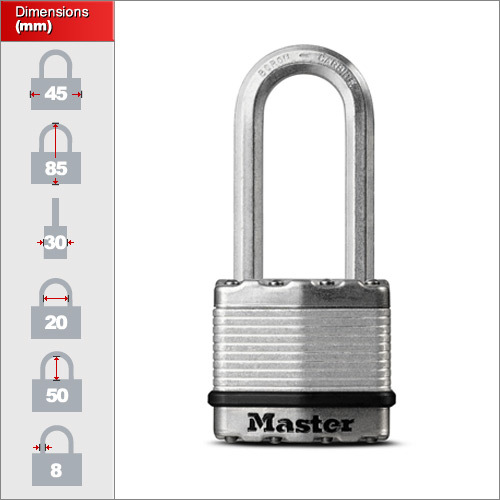 Masterlock is the first manufacturer to incorporate this technology into the shackle of a laminated padlock making it more resistant to bolt cutting attacks. Unfortuantly it will not make much difference to attacks from hacksaws. If you require keyed alike laminated locks then please see the ABUS laminated range which come in 2 sizes, all available in keyed alike. We only keep one size of this product and only. This padlock is ideal most medium to high security applications. Please note that due to its size it does use only a 4 pin mechanism which athough fine for most applications but you might want to look at the high security padlocks for securing more valuable items.